SteelSeries may not be the most popular computer hardware company, but they are solid enough to have several of their products loved by the customers. 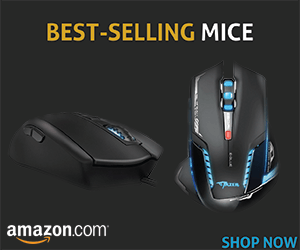 That is probably because they put forth a great amount of effort to match the industry’s finest gaming mice. 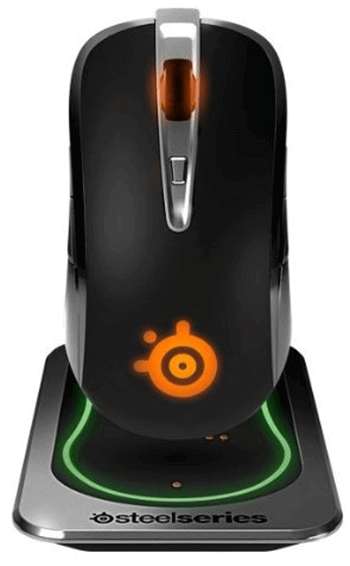 One of their best gaming mice is certainly the SteelSeries Sensei wireless laser gaming mouse. We will do this Sensei wireless gaming mouse review to see the features that are important in making a decision to buy. The design and feel of use are the first parameters we want to talk about. It features the well-known Sensei shape. This shape is standard for the Sensei and is practically adored by the gamers – eSport gamers are praising it because of just how comfortable it is. 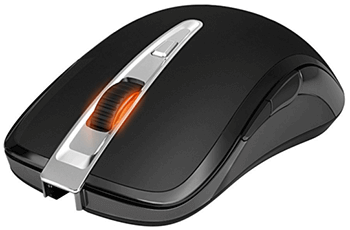 The mouse features metal and illumination which gives a great visual appearance. The base is also illuminated, and when the battery of the mouse gets low, can indicate the battery status, which is kind of neat. The SteelSeries Sensei comes with a USB cable connector which can be handy in many instances, most notably when the mouse’s battery is low and you want to play and charge it. The cable is light and you won’t feel it while playing. The weight of the mouse is almost perfect, thanks to the the build quality, which is one of the best for the price. It has a life cycle of 30 million clicks, which is somewhere above the industry standard. The powerful performance it enables is actually one of the standout features of the mouse. It has one of the best laser sensors you can find currently. The name of the laser sensor is Pixart ADNS 9800, which enables you to ramp up the CPI to 8200. 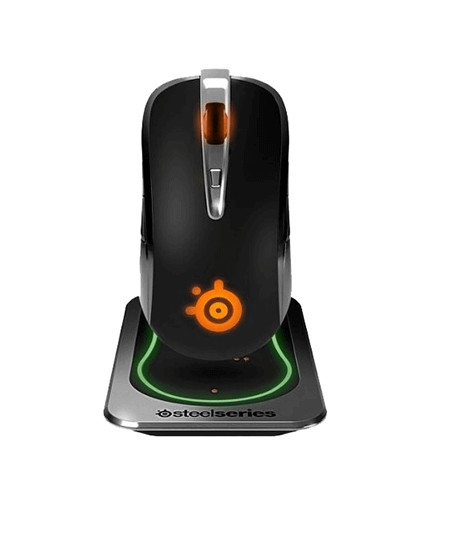 SteelSeries have actually focused largely on the performance and the design of this mouse. That is why the mouse is flawless while using. The movements are so light and precise while the clicks are not too sensitive, nor too sturdy. The balance is nearly perfect with the Sensei. For those who want more details, we must inform you that it features a 1ms response time. In my opinion, this is one of the best wireless gaming mice on the market right now. In terms of programmable buttons, the Sensei gives you 8. The software is easy to download and setup, mostly because of the intuitive and simple interface. With the Sensei and its software, you will be able to store your own profile within the mouse. That makes things a lot easier and makes the mouse extremely customizable. So, if you are in search of a quality, beautiful, and ultra-powerful gaming mouse the Sensei should top your list. Not only because of the powerful performance and the amazing sensor, but also because of the great lifespan, customizability, and the fact that it enables you 8 programmable features. Not to mention that the mouse also has a wonderful design with an illuminated base that will indicate your battery’s level. It can act as a wired mouse as well and you can use it while playing games. The charge and play feature is great. Many have argued the price as the main flaw of the gaming mouse, but it is hard to get quality for cheap price. It is available for both PC and Mac.